When I first saw the Boyd St. 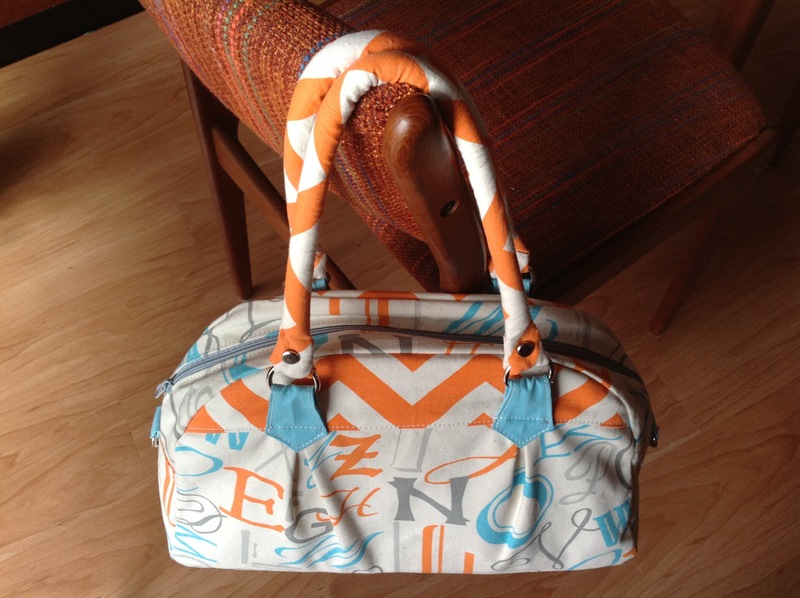 Bowling Bag by Emmaline, I was in love! 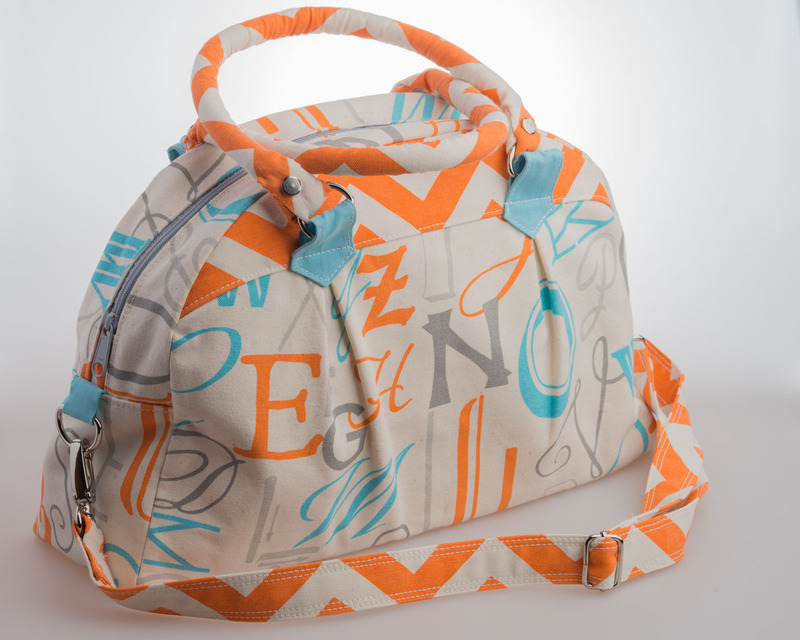 I selected a fun text print in a 7oz cotton duck in mandarin, turquoise, natural and grey for the exterior, a zig zag in mandarin (10oz cotton canvas) and twill in ocean. 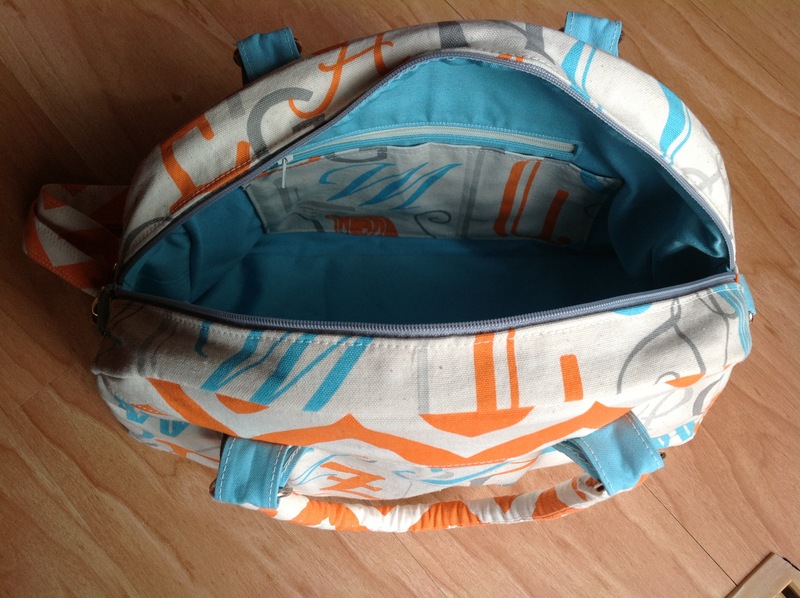 This bag features a roomy main area, interior zipper and slip pockets lots of fun hardware and a pleated exterior. I chose to make fabric covered rope handles as well as a removable shoulder strap. It was my first attempt at making rope handles and although it was a struggle to turn the fabric, I really like the results and the handles feel nice in the hand. I wasn’t sure how to finish the handles but it worked and I will try it again. The pattern is for the intermediate sewer and although I didn’t find it difficult, I wouldn’t recommend it for the beginner. I’m also working on another Steph in the City bag for my sister. Almost finished, I need to make the belt, hide my threads and sew up the lining then I’m shipping it off next week! A little “Happy Mochi Yum Yum” for lining always make me happy, I hope she likes it too! 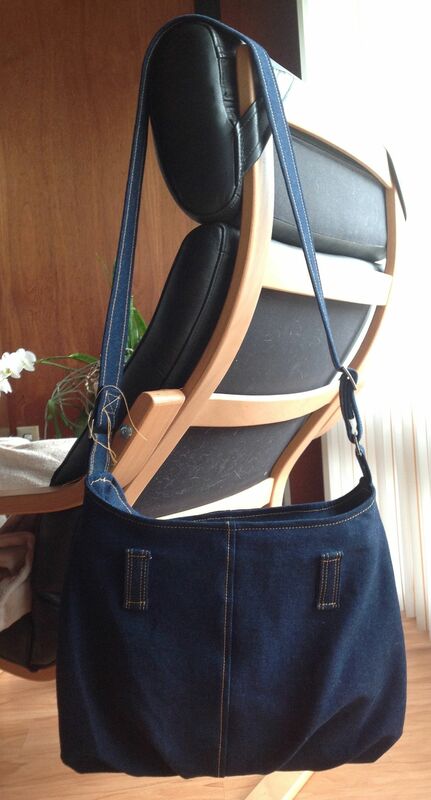 This entry was posted in Handbags and tagged Bowling Bag, Emmaline Bags, Shoulder Bag by Tabatha. Bookmark the permalink. Beautiful, I love, love the fabric you used. I didn’t care for the pattern when I first saw it, but yours has made me change my mind. It’s so cute and modern. Great job!!! Thanks Ange, love this pattern and I think I just make another! Quite honestly Ali, I don’t know how big a real bowling ball bag is but I love the size of this bag. Certainly big enough to be an overnight bag or a bag for everyday. Thanks for stopping by and commenting! 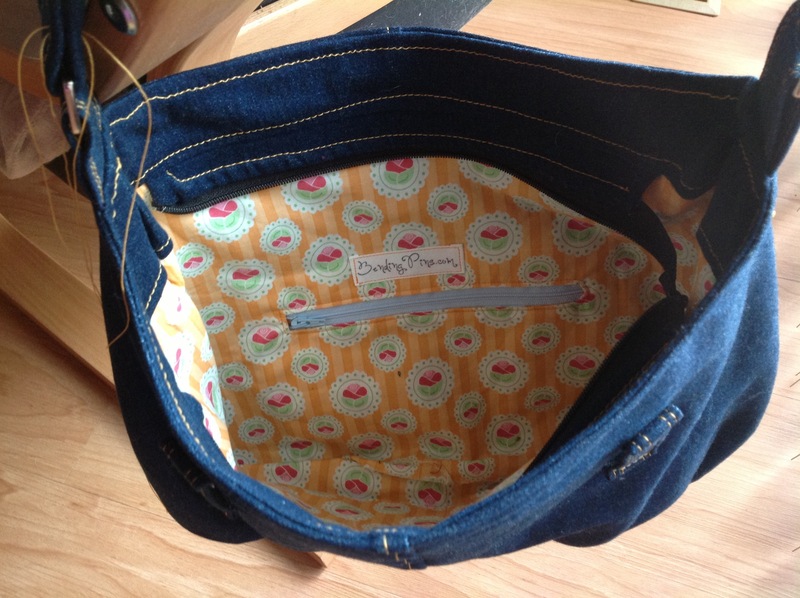 Love the bags, you seem to be up to any challenge and can complete them to perfection and with the perfect fabrics. I am a fan! Julie will love her bag too! Thanks Mom, I hope to get some goodies out to you this week! Now I am an even bigger fan, if that’s possible! The quality of your work is without equal. I consider myself to be an advanced sewer, but you put me in the shade! Not just the quality of your work, but your creative selection of fabrics. T-rific! Andrea, my head is going to swell! Thanks so much for your kind and encouraging words! Thanks Charlotte, I’m always excited to learn new techniques and improve my skills. It’s gratifying to know people recognize that!! Love the piped handles!! I had a version of those myself, but they got tossed aside and saved for another project. Love your fabric choices! It just turned out gorgeous!! Will have to share. Thank you so much Janelle, I’m absolutely thrilled you featured me on your blog!! 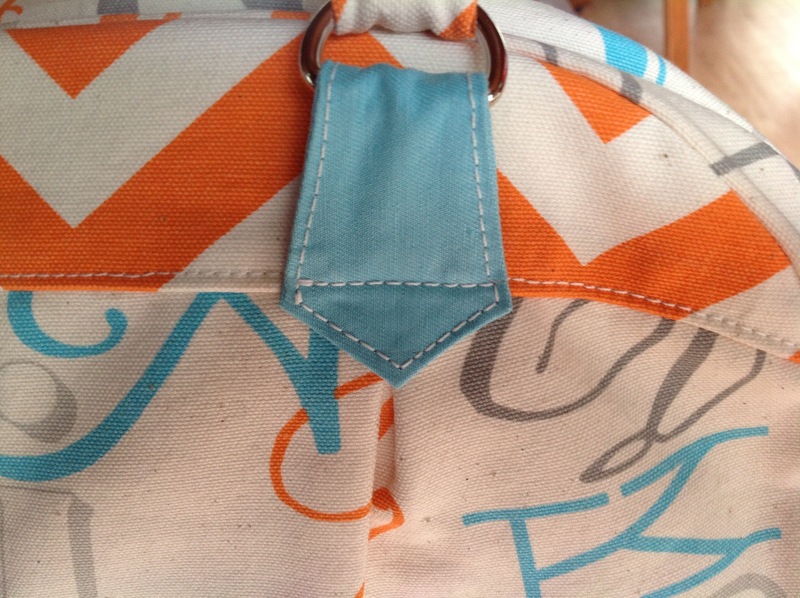 Thanks Christine, looks like you have some sweet bag designs as well! Thanks for stopping by and commenting! Oh I want one! The fabric is gorgeous! I’m a big fan of bags with plain (wrong word but can’t think of a better one) outers and cute/funky linings, like your blue one.